Famous Cursed Diamonds and Gems: Real or Imagined? Man has always had a fascination with bright shiny objects from the heat of fire to the malleable metals that fire can make into beautiful jewelry. And with that fascination is the urge to find the biggest and best – such as these six gems and precious stones. Unfortunately, some believe these famous prizes may carry their own price for ownership. Looking back at the first appearance and their subsequent journeys has put a question in the minds of the superstitious as to whether they are cursed or not. There is some debate to this day. While myth may be debunked by history, the legend, for many of these gems, lives on. There are three diamonds that grace this sextet of possibly deadly jewels: the Koh-i-Noor Diamond, the Hope Diamond and the Black Orlov. 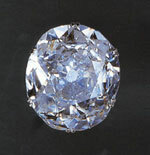 The Koh-i-Noor Diamond, though perhaps not the most famous of the six gems, has the most recorded history. According to legend, the "Mountain of Light" was stolen from the god Krishna who was asleep at the time and first appeared in Mogul chronicles as part of captured treasure in 1304 where it remained with the emperors until 1739. Unfortunately, when Delhi was sacked by the Persians, the Mogul emperor at the time attempted, unsuccessfully thanks to a member of his harem, to hide the diamond in his turban. The Persian Nadir Shah took the turban from the neck up and gave the diamond its name in wonder. The diamond stayed with the Persians for another 110 years before it was acquired by the British East India Company after the Sikh wars. Fortunately for Queen Victoria, the 186-carat stone seemed to be having more bad luck for men. Since 1911, the now 109 carat stone has been part of the coronation crowns of the Queen consorts, hopefully contradicting any "curse" on the royal males.